MAMCO examines in this large group exhibition the “Pattern & Decoration” movement, formed in the 1970s and that enjoyed international success in the 1980s, before fading in the decades thereafter. Most of the artists involved were reacting against the dominance of abstract schools in the post-War era, with a particular opposition to Minimal and Conceptual art. They also critiqued the pervasive dominance of Western art and male artists in the context of modernism as a whole. Including an equal number of men and women, the group organized around “pattern and decoration” reconnected with what was widely perceived as “minor” art forms and asserted decoration as the true repressed of modernity. Referencing ornamental motifs on wallpaper, patchwork quilts, or printed fabrics, the movement opened up Western art of the time to eclectic sources of inspiration: from Islamic decorative art, Byzantine and Mexican mosaics, to Turkish embroidery and Japanese prints, Indian rugs and Iranian miniatures. By creating works that blurred the boundaries between traditional paintings and decorative art objects, the movement’s artists—men and women alike—defined their position at the intersection between artistic disciplines, spearheading a critique of the traditional demarcation between the “fine” and “applied” arts. Finally, by reviving interest in long-undervalued crafts and asserting the right to bring these techniques out of the domestic sphere and into the public world of art, they held much in common with the Feminist art movement of the 1970s. “Pattern & Decoration” is justly viewed as an overlooked movement, but it served nonetheless as a springboard for a number of contemporary practices: taking an essentially historical approach, the exhibition aims to re-evaluate the movement and reassess its contribution in light of contemporary art today. 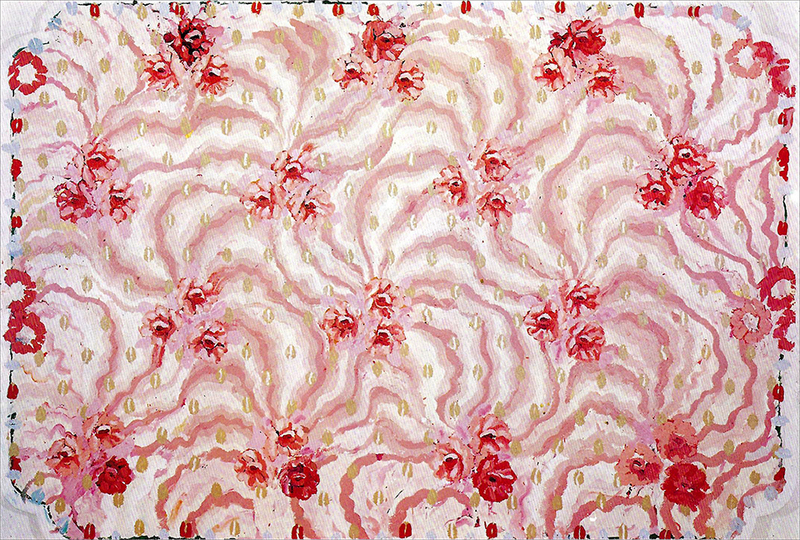 Essentially American, the “Pattern & Decoration” movement was supported by gallerists Holly Solomon in New York and Bruno Bischofberger in Switzerland, and was first formed by Valerie Jaudon, Tina Girouard, Joyce Kozloff, Robert Kushner, Kim MacConnel, Tony Robbin, Miriam Schapiro, Ned Smyth, Mario Yrisarry, and Robert Zakanitch, quickly joined by Cynthia Carlson, Brad Davis, Richard Kalina, and Jane Kaufman, and enlarging later to Rodney Ripps, Betty Woodman, George Woodman, and Joe Zucker. MAMCO’s exhibition, co-organized with the Consortium in Dijon, also includes several pieces by artists associated with the Supports/Surfaces group, Noël Dolla and Claude Viallat, whose work has been widely revisited and reconsidered in recent years, together with works by Lynda Benglis, Jennifer Cecere, Marc Camille Chaimowicz, Sam Gilliam, Simon Hantaï, Thomas Lanigan-Schmidt, Alvin D. Loving, Alan Shields, and George Sugarman. The contents of this site, including all images and text, are for educational and non-commercial use only and are the sole property of Robert Zakanitch. The contents of this site may not be reproduced in any form without the written request and permission granted by the artist. For all image requests and reproduction rights, please contact Artist Estate Studio, LLC.